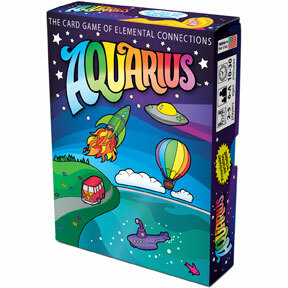 Aquarius, the Looney Labs game of elemental connections, is one of our longest-running titles! 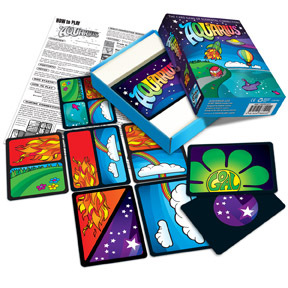 Kids love the colorful design, fast play, and familiar matching strategy. Adults love the game's competitive edge. It's the perfect family card game. Players take turns playing element cards, trying to get seven connected of their secret goal element. But look out for special actions that might change your goal, give your entire hand to someone else, or otherwise upset your well-laid plans! Each player is given a secret goal card of one of the five elements. Element cards are played on the table connected like dominoes, with each player trying to win by connecting seven panels of their goal. Action cards allow players to shake up the action in six different ways. The game is fast, fun, colorful, and easy to learn - with enough bluffing and strategy to keep adults engaged. Preschooler variations included for children as young as 3 years! Aquarius: Because it looks SO GOOD!